I am someone who likes traditions. I like doing something for an occassion and then always doing it on said occasion. Whether this be Taco Bell on the first night of Summer Camp or a new tradition of Shula’s on New Years Eve, I simply just like traditions. I’m sure this drives everyone in my family crazy and they see it as another one of Nicki’s OCD/Control Issues but, they can just deal. Traditions make memories and memories make me smile. One of our Spring Break Traditions is a restaurant called Buffalo Chips. We started this tradition 3 years ago due to the fact that they have 50 cent wings on Monday’s. So, for the past 2 years we have gone on Monday’s only to be swamped with people in the restaurant, long waits and incorrect orders. This year we decided to forgo the cheaper price and go on a Sunday. Thumbs up to us because this made the experience oh so much better. 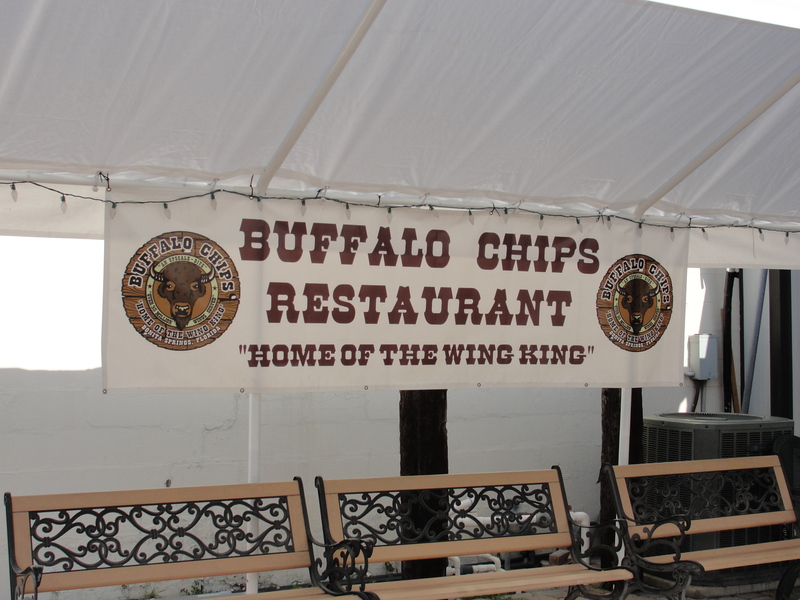 Buffalo Chips is an upscale dive located in Bonita Springs and is quite popular. The decor does not change from year to year and you certainly feel as if you are going retro when you enter. 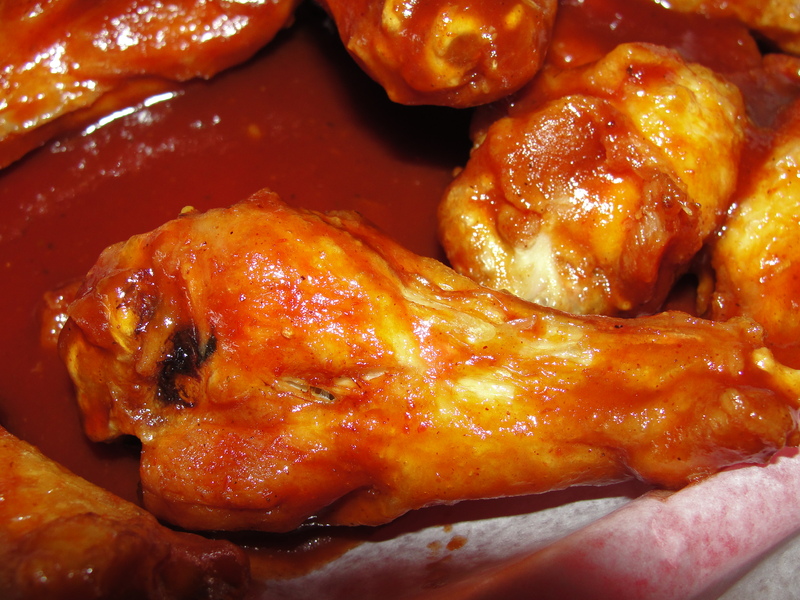 The menu offers a variety of items but, they are known for one thing – their wings. Prior to this years trip, I had never ordered wings as my meal. I really don’t like wings and they normally upset my stomach. But, every time we go, I have a wing and say how great it was and how I will certainly get them next time. Well, next time finally arrived and I ordered 10 BBQ wings for my meal. Mommy and Taylor both got Mild Wings and we ordered a basket of straight cut fries to share. 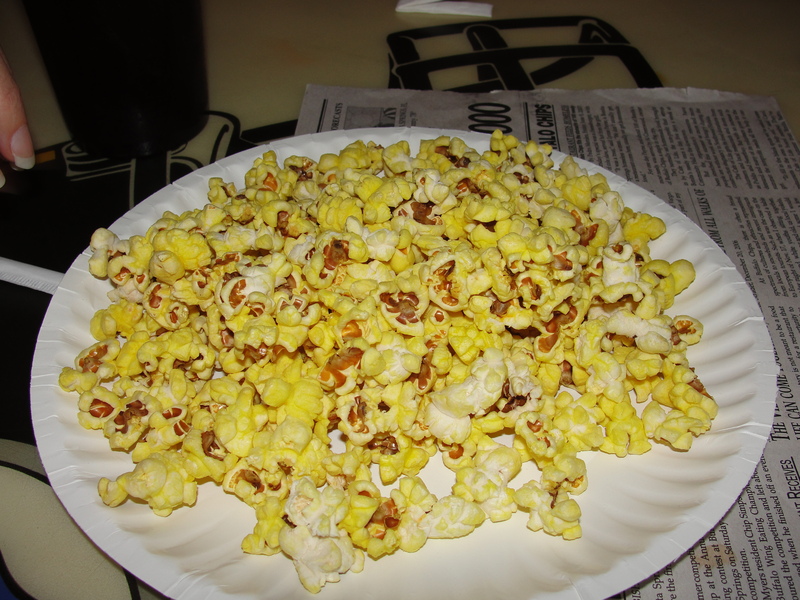 While waiting for our food, Buffalo Chips has a popcorn machine which I, of course, got 2 plates worth of to share. The popcorn was not hot but hit the spot to hold us over for wings. The popcorn is so overly buttered in taste and oh so salty – two things I never normally like. But, for whatever reason, it tasted great and we easily ate two plates worth. Getting the popcorn is a must when you visit Buffalo Chips. Plus, it’s free! After waiting a bit, our food arrived. Well, most of our food arrived. My wings were nowhere to be found. This didn’t really surprise me because the service is really not too great. After waiting a few more moments, my wings made it to our table and I had to control myself from plowing right into them. Wow, did they look great. Buffalo Chips serves up the biggest wings I have ever seen and they were no exception. Served with a side of blue cheese and celery, I was so ready to dig in. 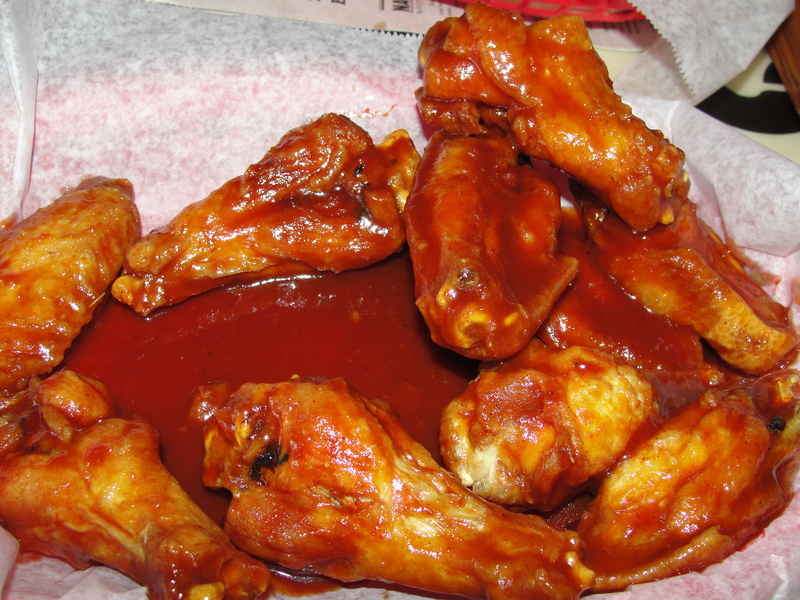 The wings had a lot of bbq sauce on them and even more in the basket. I’m not sure if this is the normal amount or I got extra since they were in a hurry. Either way, this was fine with me. I found myself dipping each wing in the extra bbq sauce before I ate it. The bbq sauce was very thin and basic in flavor. I would not call this sweet, spicy or tangy bbq sauce at all. But, this was just fine because it worked perfectly with the wings…which was kinda the point. The wings were fried just enough to enhance the flavor of the chicken rather than disguise it. Every bite contained juicy, moist, perfectly cooked chicken – and lots of it. Like I said, these wings were big and for real. No players here. The combination of the juicy chicken and the simply bbq sauce, produced an out-of-this-world wing. The wings are so good on their own, that the addition of blue cheese is really not needed. 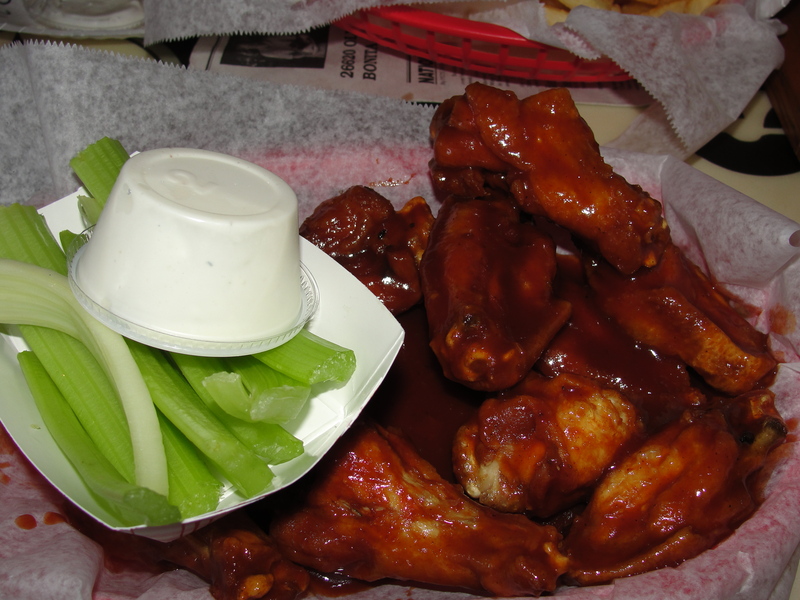 I did dip some of the celery into it and eat it between wings along with some fries. These fries were good, hot and tasty. 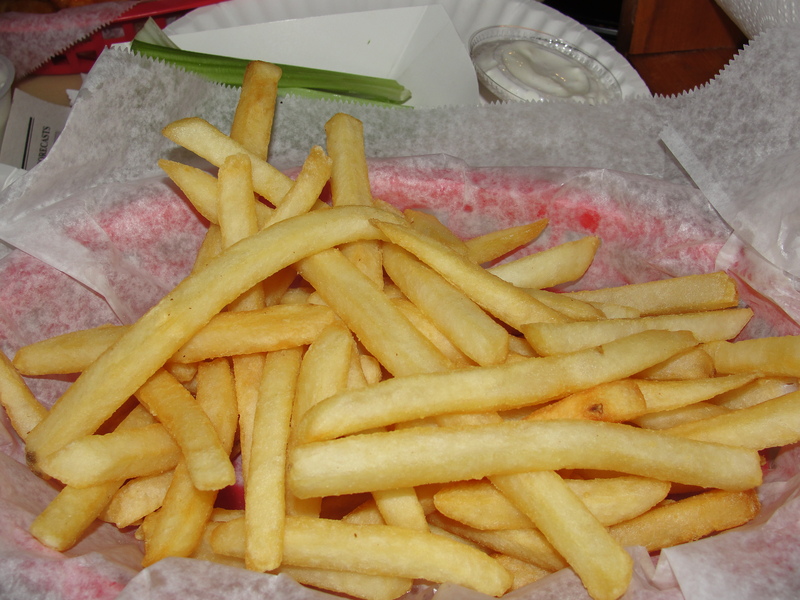 Straight cut fries in their simplest form. They were seasoned only a bit which allowed the fry to have a very basic taste – a good compliment to the saucy wings. The interiors are fluffy and the overall fry is good. I wouldn’t say these are the best fries ever but, I do think these are the best fries to compliment the wings. Buffalo Chips also offers buffalo chips and curly fries but to me, the straight fries are by far the best option. I easily finished off my 10 wings and was ready for 10 more. The meal was absolutely delicious and I ask myself why I never ordered wings on our previous visits. While the service leaves much to be desired, make a trip to Buffalo Chips for the food. I don’t think the meaty wings, great sides and of course, the free popcorn, will let you down. I know that I will be continuing to order the wings each and every year as our Spring Break Tradition continues. To me, traditions are great and Buffalo Chips is one Tasty Tradition.